It is the same as saying people look at you and focus only on the wrong that you've done, but when the time comes, and you do what is right, there is no memory of it. The truth is, as long as you live on this earth, you will be talked about and criticized. But at the end of the day, may the deeds that you have done speak for you in the most positive and uplifting way, to motivate and inspire others for change and, to transform the world through the legacy of the right things that you do each day. 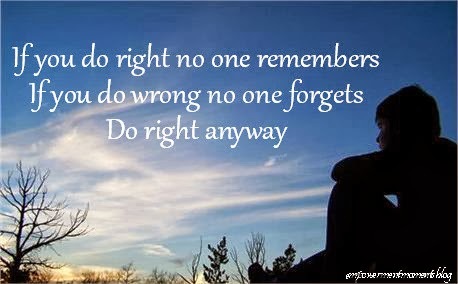 Aim to always do what is right! So very true. We will always experience criticism our whole lives (and some of it behind our backs) but regardless we should alway do what is right. Pinned this! Absolutely Kalley! It has to do with how we handle it as well...not to go to the level of our critics but to rise above them and speak good and do right. Thanks for Pinning also. Blessings my friend!